This production of William Faulkner’s classic novel is described as experimental, physical theatre. I can see the physical element for sure, but I’m not sure it was that experimental. Perhaps the folks who were discussing whether they should leave at intermission would disagree, but I thought Theatre Smith-Gilmour was using physicality and no props to fill our imagination with a highly detailed story. A show that can create scenes in our mind’s eye without the use of props is much more of a success than a show relying on elaborate set pieces to create the scene for us. That being said, this type of theatre does require some work on the part of the audience. You have to be willing to meet the actors half way, if you will. There are assumptions to make, imaginations to exercise, and disbelief that may need to be suspended. But if you can do all this, it is highly rewarding. We follow the Bundren family as they struggle to move their mother’s body from their home to the town where she wanted to rest. The father, Anse (Dean Gilmour), is by far the most enigmatic character, seeming to only be concerned with how long something will take or how much money it will cost. Not once does he show an ounce of love or tenderness for his family members. There are some dark moments, such as when Anse explains that the reason for living is to get ready to stay dad a long time. But there are also some very lighthearted moments, such as watching one of the brothers gallop around the stage, an imaginary horse beneath him. 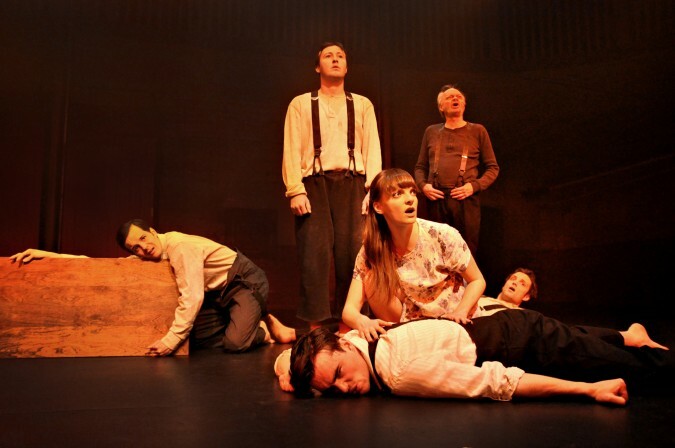 This evocative play does so much with so little as seven actors perform 19 roles. Even though there was no wagon, no household items, and no furniture, the use of sounds, movements, and lighting allowed us to bring the story to life in our minds. They triumphantly use the power of theatre to its full effect, transporting us to Faulkner’s Southern Gothic world.